For the ultimate in performance, replace your stock rubber front end components with either our POLYPLUS front end kit or our POLYPLUS complete front end kit. These kits offer increased longevity and outstanding performance. POLYPLUS performance graphite bushings are the ultimate combination of polyurethane for performance and durability along with the superior lubricating qualities of graphite for smooth and quiet operation. Both kits include upper and lower ball joints, outer tie rod ends, control arm bushings and bump stops. Sway bar bushings sold separately. 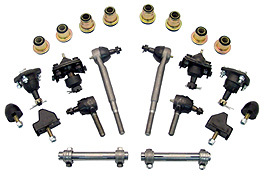 The complete kit also includes inner tie rod ends, tie rod adjusting sleeves, and idler arm bushings. Note: #5557SFK-P will not work for original power assist.